I've always wondered how restaurants make pork schnitzels so thin and perfectly crisp, with that "wrinkled" coating. According to Cook's Illustrated, where I got this recipe, I learned the frying method is where the secret is. Instead of sauteing the cutlets, these are cooked in a Dutch oven with some oil and shaked in the pot to allow the oil over the top of the meat. It appears that the heat hits the eggwash in the coating so that the steam from the meat puffed the coating to achieve the wrinkled look. It takes some practice, which I plan on doing again since my cutlets weren't as wrinkled as they could have been. Traditionally, these cutlets are served with garnishes of lemon, parsley, capers and hard boiled eggs, however I served these cutlets with roasted asparagus and a creamy cheesy rice. Place the breadcrumbs in a shallow dish. Spread the flour in another shallow dish. Beat the eggs with 1 tablespoon of oil and place in a third shallow dish. 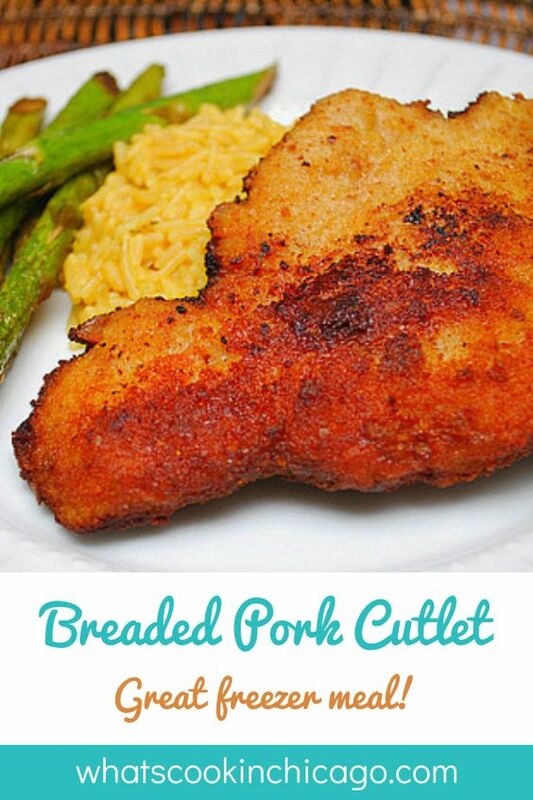 Cut pork tenderloin into 4 equal pieces. Place the pork, 1 cut side down, between 2 sheets of plastic wrap and pound to an even thickness of between 1/8 and 1/4 inch. Season the cutlets with salt and pepper. Working with 1 cutlet at a time, dredge the cutlets thoroughly in flour, shaking off the excess, then coat with the egg and then coat evenly with breadcrumbs, pressing on the crumbs to adhere. 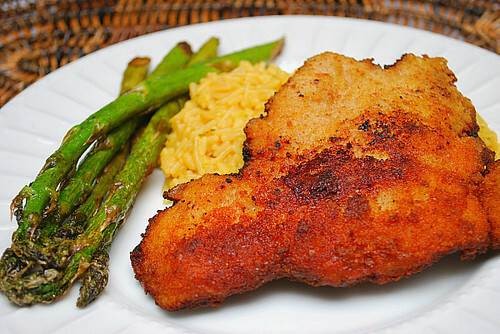 Place the breaded cutlets in a single layer on a wire rack set over a baking sheet; let the coating dry for 5 minutes. Heat the remaining 2 cups of oil in a large dutch oven over medium high heat until it registers 375 degrees. Lay 2 cutlets without overlapping, in the pot and cook, shaking the pot continuously and gently, until wrinkled and browned on both sides. Transfer the cutlets to a paper towel lined plate and flip the cutlets a few times to blot the excess oil. Repeat with the remaining cutlets and serve. * To make ahead/freezer meal - Prepare the cutlets as directed as above. Once the coating on the cutlets have dried for 5 minutes, place them in a freezer bag, seal and freeze. When ready to prepare, defrost slightly. Heat 2 cups of oil in a large dutch oven over medium high heat until it registers 375 degrees. Lay 2 cutlets without overlapping, in the pot and cook, shaking the pot continuously and gently, until wrinkled and browned on both sides. Transfer the cutlets to a paper towel lined plate and flip the cutlets a few times to blot the excess oil. Repeat with the remaining cutlets and serve. These look delicious!! I'm definitely going to be making them. Thanks for posting. I made these and my family loved them. Perfect directions! Brought back memories of our time in Germany. Made these tonight and they were amazing. Even my extremely picky 4 year old ate them without complaining. These will defiantly be a keeper meal. Thanks for the recipe! up the excellent quality writing, it is rar to see a great blog like thiѕ onne these days.